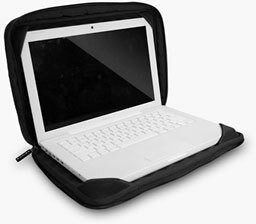 Heading back to school or the office with a new 13" MacBook Pro or MacBook Air and looking for a protective case worthy of such a fine piece of equipment? Something that, like your 'Book, is special and more than just run of the mill? If so, one you should definitely consider is Uniea's recently expanded Omniverse series of cases for 10" and 13" laptops, as well as models to fit iPods, iPhones, and other small electronic gadgets and accessories. The Omniverse cases are offered in conventional nylon - or for a sumptuous touch that is distinctly different, in quilted silk - notwithstanding it's relatively modest price of $39.95. Uniea is a Hong Kong-based company, and the Chinese have a long history and tradition of working with silk, a natural fabric that was first developed in ancient China, possibly as early as 6000 BC (and definitely by 3000 BC), becoming a highly prized commodity of pre-industrial international trade from ancient times through the Middle Ages. China is still the world's largest silk producer by a margin of nearly three to one over number two India. The only significant producer of silk in the western hemisphere is Brazil, which holds fourth place after Uzbekistan. Aside from silk's luxury look and feel, the thing that impresses me most about these Omniverse cases upon close examination is how uncannily lightweight they are. I checked the test unit out on my postage scale and found it weighed in at 390 grams, which translates to 13.75 ounces. This case is are not going to add to your burden to any significant degree. Another neat feature of the Omniverse laptop tote is that its briefcase handles completely and securely hide away in snap-closure pockets flanking the opening aperture, converting the unit into a tidy sleeve. However, when you do want to use the handles, they can be popped out instantaneously. They have a silk-faced, foam-padded grip for comfort. The front of the Omniverse Universal Tote has a full-width pocket large enough to accommodate 8-1/2" x 11" papers and standard-sized magazines. 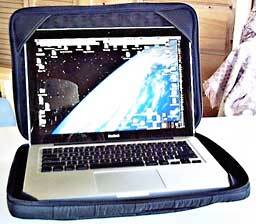 Undoing the twin zipper closures, which have soft rubber-like pulls embossed with the Uniea name in white block capitals, the case's back panel swings open like a laptop screen lid, revealing an "egg-crate" textured memory foam liner designed to dissipate heat and cradle your MacBook gently. Both the top and bottom panels have triangular elasticized fabric gussets in their top and front corners respectively to hold the MacBook securely in place. You can use the computer in situ if you wish, which is convenient if you're just grabbing a few moments of keyboard time during your commute or during waits and delays when you're traveling or making office visits. 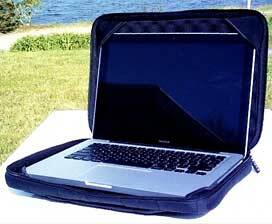 The Universal case also insulates your thighs from heat when used in in literal laptop mode. The Omniverse Universal Tote fits my 13" Unibody MacBook like it was made for it (which it was), and the new 13" MacBook Pro has identical dimensions. The retainer gussets don't obscure the computer screen or obstruct access to the keyboard and trackpad, and a MacBook Air will fit nicely as well. 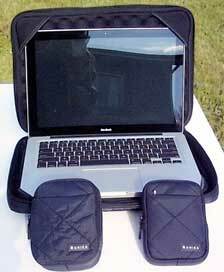 It also works with the white or black 13" MacBook and with small PC laptops. Despite its feather-light weight and compact dimensions, the Omniverse 13.3" Universal Tote case seems quite robust, with semi-rigid reinforcement around the periphery of both the bottom and the lid/back panels, which, combined with the generous foam padding, should protect your pride and joy from bumps and abrasions. The case appears to be very well constructed, with neat, even stitching, no loose threads or rough edges, the zippers operate smoothly, and the silk cladding makes them look and feel like a million dollars. My only complaint about the silk is that it picks up and shows dust, but dust also seems to easily brush off. Another observation - not really a criticism - is that aside from the big front pocket, best-suited to carrying flat items, there is no really suitable place for stowing peripherals and other bits, such as a USB wireless mouse receiver dongle, cables, and so forth. Of course, that's what the smaller Omniverse cases are in aid of, being styled and constructed to match the Universal Tote case perfectly right down to full-width front zipper pockets. Inside, they share the same egg-crate pattern memory foam padding, and both also have aluminum quick-release rings on the back for attaching them to a belt loop or whatever else is handy. 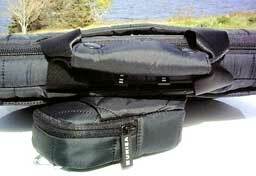 With three sizes available, the small Omniverse cases may be used to carry the aforementioned computer accessories, an iPhone, iPod, digital camera, a 2.5" external hard drive, or what ever else you have in that size category. The Omniverse cases are also water-resistant, with the middle component of their five-layer shell being a water-resistant membrane. The case's five skin layers are, working from the outside in, the silk outer skin, a layer of cotton padding, the water-resistant layer, the memory foam padding, and an inner soft fabric contact lining. 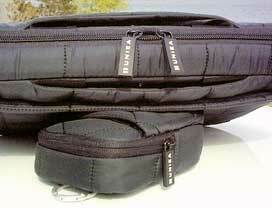 The two smaller cases are identical in width and depth, varying only in thickness. Of course, if you anticipate really rough service, the nylon version, which will be more rugged than the silk, might be the more practical choice. 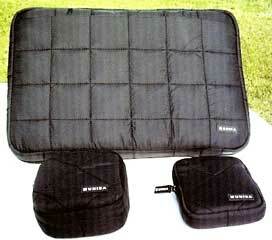 Inner material is shock absorbent for total protection. 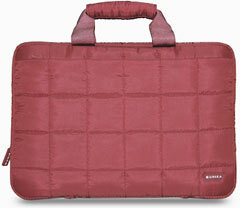 Stylish silk fiber material is light and adds little weight to your hard drive. 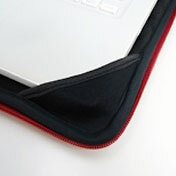 Front pocket is large enough to hold a long USB or FireWire cable. Size and dimensions are perfect for small digital cameras, iPod, iPhone and similar size devices. Unique, stylish silk fiber material is incredibly lightweight. 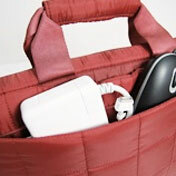 Front pocket easily accommodates ear buds, cables, and other small accessories. 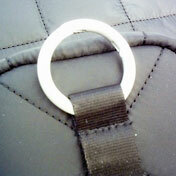 Belt loop and aluminum, carabiner-style ring for maximum portability. 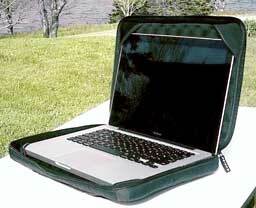 Aside from the silk or nylon skin, features of the Omniverse laptop and other cases include unique interior memory form material that conforms to the shape of the computer and effectively dissipates heat, lightweight construction, impact-resistant protection, and a stylish, comfortable feel (especially the silk versions). The Omniverse is available as a tote bag with neat hideaway handles, or as a universal sleeve, and comes in your choice of black or red silk fiber and black or red nylon styles. 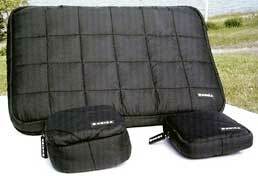 I'm going to rate the Omniverse Universal Laptop Tote 3.5 out of 4, taking into account its limited peripherals carrying capacity as my only significant criticism.